Kitchen makeover on a tight budget- with my tips for success and stories of my fails. I have real life budget friendly ideas you can use to transform your kitchen into a beautiful and functional space. Some of my ideas have developed (so to speak) from years of being a mom and a DIYer. After remodeling several houses and designing and building a home many years ago, I have found several kitchen ideas that work well for me and my family (which at one time included 4 kids). My family has recycled for many years so hiding the recyling and garbage was one must have and easy access to load and unload the dishes was another. I also do not like clutter on the counter tops so using drawers and cabinets to house small appliances was crucial in the placement and use of certain cabinets. My kitchen makeover has taken almost 8 years and is 95% done! Yes I am admitting it is not completely done because I have some final touches to do yet. Renovating and remodeling a home that had been neglected for years (before we bought it) has been a continual work in progress for me (and my hubby when he is home). I really wish I could show you what it looked like before but I had lost thousands of photos and documents on my computer a few years back when it crashed. (I learned the hard way to always have a back up of your photos and files.) I also expanded the kitchen by relocating the 1/2 bath and laundry downstairs to make the kitchen larger. The window over by the floating shelves helps make the kitchen brighter in that area otherwise it would be dark. I love windows and natural sunlight so the window had to stay and I worked the kitchen design around it. after the kitchen is gutted and I think things can’t get any worse, I walk into the kitchen one morning and look up to see a very large brown spot on the newly painted and texturized ceiling. (Okay my first clue that there were going to be problems should have been the newly texturized kitchen ceiling.) I knew what an expanding brown spot meant so I took a screwdriver and poked the ceiling to see how soft it was. Yep you guessed it-a piece of the ceiling fell down on my head and of course I screamed. My oldest son comes in the kitchen and says “mom what happened?” and then he looked up. The previous owner had painted the ceiling right before he put the house up so there was no reason to suspect any plumbing problems. So 2 weeks into owning our ‘new’ home we had a major plumbing issue on top of everything else. Then to make matters worse- the previous owner had used a torch to melt a PVC pipe and a piece of galvanized pipe together for the master bathroom shower drain which instead of flowing downhill was angled uphill which made the water sit there and and slowly drain. Yes this guy was a complete and total idiot and we were not much smarter for buying this house. At least with this catastrophe we learned why the master bathroom shower slowly drained. What is super funny for me now is that I kept pouring in a bottle of Drano believing, hoping, and praying that it was just a hair clog. Thank goodness my husband can do some plumbing because that fiasco would have cost a fortune. Let me just say I could write a book about the misfortune of buying a house from someone who drank and played Mr. FixIt. 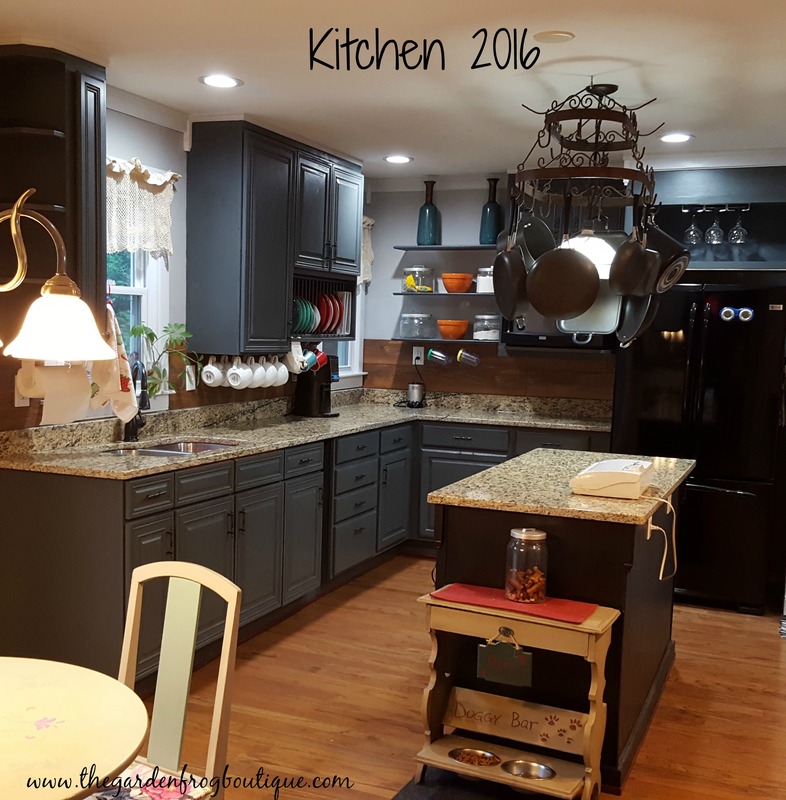 Back to the kitchen makeover and looking at the picture below, you can see that I had to find a way to close up the gap above the mismatched cabinets plus I wanted to add crown to dress up the kitchen which I did this year. It took me a bit of creative thinking to get the crown molding to flow around the room and cabinets because I could not use the same 2 board crown molding idea throughout the kitchen because above the cabinets were different heights. Sometimes you just have to think outside the box. How I really hope to impress you is with my budget over a 7 1/2 year period – no more than $5,000- for the whole kitchen gut and transformation including sheetrock, new windows, and patio door. What is really going to blow your mind is that I got the 2 pieces of granite for the island an cooktop area for $50 a piece. They were a special order granite and worth about $2,000 when I got them at a granite warehouse closeout sale. The next day I called around and found a granite place that fabricated them for $450 to my dimensions. I fell in love with this granite which has flecks of blue and gold in it and really looks great with the blue/gray of the cabinets. There were only 2 pieces of this beautiful granite so that is one reason I have lived with mismatched countertops (and the other being budget). Okay I digressed a bit so back to the kitchen makeover and another lesson I learned. If you have wood cabinets and want a nice beautiful glossy finish use latex paint. Do not use chalk paint. The Finish is not smooth and it is really not time saving or professional looking up close. Sure my pictures make my kitchen look fabulous but up close the finish is not completely smooth and it looks ‘painted’. I have painted the cabinets twice since 2013 only because the cabinets were mismatched and different finishes. In 2013 I also put up the backsplash you see for $10; and even though it is not my first choice, it works and still looks good today. If your cabinets are old and not real wood, then use chalk paint which will hide a multitude of sins. However I have a lesson for you: you need to degloss the wood cabinets first. I read a few years back that you do not have to ‘prep’ the cabinets or pieces of furniture to use chalk paint. For chalk paint, what I remember reading, was just make sure the cabinet or piece of furniture is cleaned really well. That’s what I did- cleaned the cabinets and painted them. What a disaster! The chalk paint did not adhere on certain cabinets that were glossier. I did not let the paint cure/dry before I put on the handles and I scratched up the cabinets within the first day. It is important to let the paint cure/dry for at least a day (I waited 2 days this time). Plus, and this is a biggie, I did not degloss the cabinets which is crucial for adhesion of any paint. I lived with the areas around the handles chipped and scratched for 3 years. A daily reminder that getting in a hurry when painting and renovating does not work. 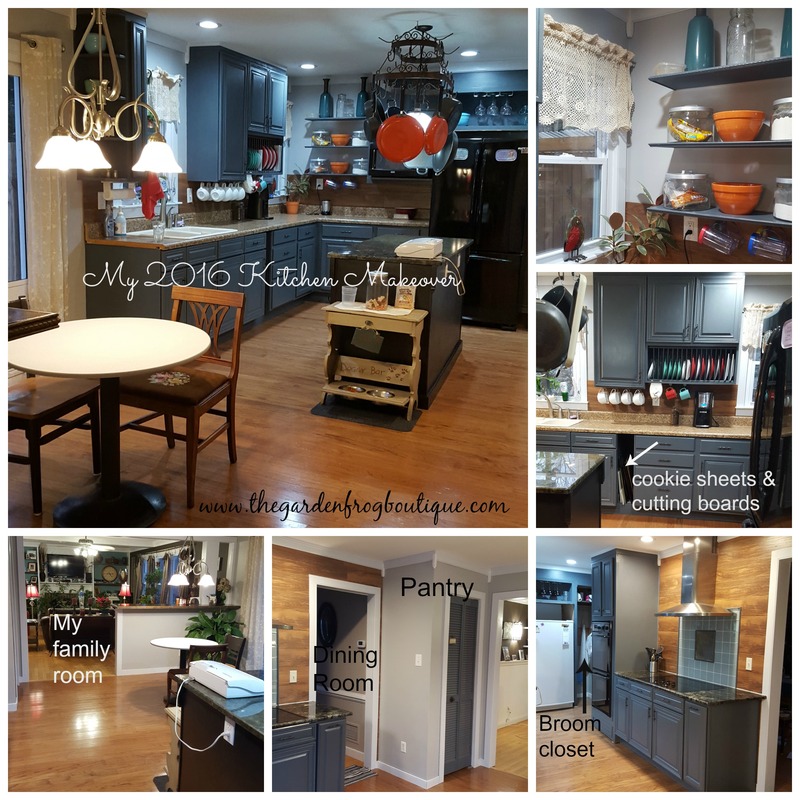 For my kitchen makeover 2016 I had the cabinet paint “color matched” at Home Depot and repainted all the cabinets again because the paint was not matching on all the cabinets. This time I used a deglosser and cleaned them really well and painted using my own chalk paint again. Homemade chalk paint works really well too because you have have your own color and it is considerably cheaper than the brand names. (note: I have used 2 brands so far and prefer to make my own). I do not always use chalk paint but like I said 3 years ago chalk paint was the ‘thing’ to do so I did it. I used a satin polyurethane on my kitchen cabinets for durability and a bit of sheen both times I painted them. This time I let them cure for a day then used the coat of polyurethane (which 2 coats would be best). You can use wax too but I am always wiping down my cabinets so I opted for polyurethane. I let that cure for a day before I let my family touch the cabinets and then I waited another day before putting the freshly painted handles back on. Believe me I was nervous the whole time putting on the handles afraid that I would scratch the new finish. If anyone out there has fixer upper and low budget, I hope some of my tips will help inspire you and transform your home. Keep watching as I try to post more tips and tricks for the low budget DIYer. Thanks for stopping by and remember that your house is no worse than mine was! I am not done renovating yet and we still need a new roof, the house has structural damage from the previous owners ignorance plus our heat pump is old. Not sure what we will do next but as long as the house is still standing, the roof doesn’t leak, and the heat pump still works- I am one happy woman. Lesson learned and to share: ALWAYS HAVE A HOME INSPECTION this is the most important piece of advice I can give you if you are thinking of buying a home.